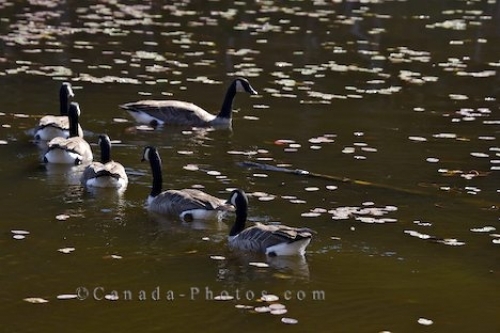 In this picture taken in Parc Omega in Montebello in Quebec, Canada a family of Canadian Geese swim in a line as the sun glistens off the water. A family of Canadian Geese take their swimming lessons for the day with their mother in the lead on a pond in Parc Omega in Montebello, Quebec. A family picture of wildlife is always priceless as you watch the mother tend to her young just as a human would take care of hers. Canadian Geese, Branta canadensis, at Parc Omega in Montebello, Outaouais, Quebec, Canada. Picture of a flock of Canadian Geese floating across the surface of the water in Parc Omega in Quebec, Canada.